Despite his young age, Mills Oakley Lawyers partner Daniel Livingston has already enjoyed a highly successful career and has helped propel the firm’s corporate practice towards $1 billion in deals this financial year. Considered a trusted adviser by leading brands that have included Tabcorp, Echo Entertainment, Fosters Limited, ANZ, Westpac, Philip Morris, Incitec Pivot, Exxon Mobil and AWB Limited, Livingston is one to watch. He tells Australasian Lawyer the keys to his success. Tell us a bit about your background: Where did you grow up? And how did you become interested in law? I am from Warrnambool in country Victoria. After secondary school, I left Warrnambool to study law at Bond University in Queensland. I completed my LLB (Hons) in 1995 and returned back to Victoria. I was admitted to practice in Victoria at the ripe old age of 21. I first became interested in law at secondary school around year nine. There is no doubt television’s portrayal of life as a lawyer (think LA Law) helped initially capture my attention. I then did my year 10 work experience at the Warrnambool Law Courts working with the Court Registrar. That was a fantastic experience and confirmed my interest in the law. 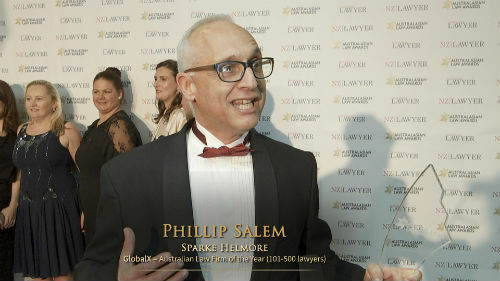 You are a successful corporate lawyer who has acted on significant and complex transactions- what do you feel has been the key to your success? I have been very fortunate to have some amazing opportunities in my life. I am extremely thankful for my university education, the various professional mentors I have had over the journey and the career opportunities that have come my way. That said, I think the path I have chosen along the way has been the biggest key. My path was not a typical one. I started my career in private practice and spent time at a few firms along the way. I spent the majority of my early legal career at Blake Dawson Waldron (now Ashurst) – spending what is still the largest portion of my private practice life to date at that firm. As a relatively ‘senior’ Senior Associate, I left Blakes and moved in-house to Tabcorp Holdings Limited. After Tabcorp, I spent the next 3 years of my career working in New York. During this time, I completed my MBA - focusing on leadership and innovation. I returned to private practice in Australia on my return from New York. In addition, I have also been a Director (and Chairman) of a few public companies (listed and unlisted). My experience as a company director, lead me to undertake further studies in corporate governance and risk management. All of these different experiences have given me, what I consider to be, a very well rounded perspective of the commercial and financial world. I believe these experiences allow me to deliver legal and strategic advice in a commercial context that clients appreciate. -What are some of the biggest issues facing the corporate sector in Australasia right now? In one word, transition. Over the past year we have seen a number of examples of Australian industry – the automotive sector, manufacturing and media to name but a few – who have faced fundamental challenges to the viability of their operations. In some cases, these challenges are simply cyclical and in others cases we have, regrettably, seen some industries move offshore. We’ve also seen the mining sector trying to come to terms with the post-boom environment. So the corporate sector has had a few things to deal with. Not only are we trying to kick start the economy in a rather unpredictable environment, but we’re also dealing with disruptive new technologies and methods of production which will mean that some industries are under intense pressure to be more efficient and find new sources of revenue. Manufacturing and media are the obvious examples, but I think all corporates will be challenged on this front in one way or another. Other major issues facing the corporate sector include data and information overload; continued economic and financial uncertainty leading to a short term planning focus; globalisation; accelerating rate of technological change and business complexity; innovation (or lack of it). Moreover what are some of the biggest issues facing mid-large size firms in Australasia as a whole? There is an old adage that a company is only as good as its people and that is particularly true in a professional services context where people are our most valuable asset. The talent war has heated up over the past five years and most mid-size firms now recognise that there is an imperative to build scale and there is a limit to how much growth can be had organically. So I think the key challenge for firms will be how well they can execute a strategic hiring policy and avoid the trap of “growth for the sake of growth,” while retaining their existing people. But overall I am optimistic about where the mid-size sector is heading. We’ve all witnessed the top tier distractions with mergers and globalisation and this provides an opportunity for the more ambitious mid-size firms to move into that premium national service space – provided they can deliver the right value proposition.